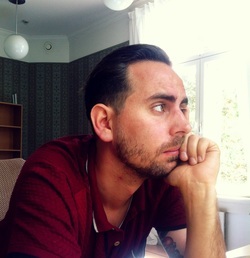 Finland-Swede Philip Teir is considered one of the most promising young writers in Scandinavia. His poetry and short stories have been included in anthologies, including Granta Finland. The Winter War is his first novel. He is married with two children and lives in Helsinki, in the same neighbourhood as the family in his novel. Congratulations on the publication of your debut novel. How does it feel to have it out in the world? Thank you! The book was published in Finland in 2013 so it’s been out for a while. It’s been fun. As a writer you don’t always know what you have written until the readers tell you. Has anything surprised you about readers’ reactions to the novel? One thing that has been interesting is hearing from older readers who say that they’ve enjoyed the description of the middle age couple in the centre of the book. When I started writing I knew I wanted to write about an older couple, just to ditance the characters from my own life, and I’m glad if I pulled it off. The Winter War illuminates the cracks in the system of a liberal, middle-class family in contemporary Helsinki. How do the family’s tensions reflect changes in the society as a whole? I think that there is quite a bit about the war of the sexes in the book, and also it seems to deal with manhood in decline, even though I’ve never planned it thematically like that. I guess when you write a book about contemporary life the book has to reflect contemporary society, that’s sort of the whole point. After I wrote the book I’ve thought that it should maybe have dealt more with unemployment and the uncertainties and worries that young people face today, which is really becoming a central theme for my generation, even in the well-off middle classes. The description of the cracks in the middle-class aren’t very sadistic, it’s not like a Michael Haneke movie or something like that. I didn’t want the distance between the narrator and the characters to be too big. Your title echoes a period in Finland’s history and could apply equally to the breakdown of Max and Katriina’s marriage as to the Occupy movement in London observed by their daughter, Eva. How did you choose this title and what does it mean to you? The title came from frustration. A lot of Finnish literature deals with national history, even contemporary fiction, and it probably has to do with Finland being a very young nation. I didn’t want to write another novel about the Winter War so I decided to just use the war as a metaphor. Max, like you, is a Finland-Swede. How crucial to his character is his membership of a minority group and what subtleties about his background might non-Scandinavian readers fail to pick up? It isn’t a very central part of the novel, because the book doesn’t deal with language issues. Actually one of the points that the novel makes, I think, is that the global upper middle class is very similar all over the western world. But one thing that English readers might miss is that the family in the book is bilingual. Katriina speaks Finnish. So Max and Katriina speak Finnish with each other, although I wrote the book in Swedish. There is a lot of Finnish spoken in the novel and even scenes where people are speaking three languages. The reader gets to glimpse the lives of all four family members over one particular winter. Who of the four did you most enjoy creating? I really enjoyed writing about Eva in London, there was a lot of fun plotting and those chapters also have a contemporary feel. And I liked writing about Katriina, once I figured out how to do it, which was tricky, because she is 55 and has been married for 30 years, unlike myself. One of my favourite aspects of the novel was how you flesh out your characters by showing them at their places of work and study. I don’t see this as often as I’d like in my reading and wondered if this were a conscious choice on your part? Yes, very much so. I didn’t want it to be a book where we are only in these characters' heads. I don’t think life works that way – a lot of life is interacting with other people. And there is a mundane quality to the work place which I think is fun to try to write about, maybe because it is not traditionally “literary”. A story of a family in northern Europe over the winter months, but we don’t see them at Christmas: did you have any particular reason for this? I decided not to have a big Christmas chapter because it would maybe have overshadowed Max’s birthday in the book, which is more important. I was extremely impressed by your deployment of wry humour and subtle irony. Do you have any tips for emerging writers of how to achieve this? I think irony can be tricky, because I don’t want to laugh myself through a book about a family, there has to be real emotion. So use it carefully! Otherwise it becomes cynicism. Which can be good in a certain type of writing or character, but maybe not for a whole family story. 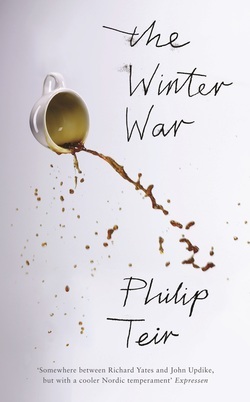 The Winter War was written in Swedish and translated into English by Tiina Nunnally. What was your experience of having your words translated, particularly into a language in which you are also fluent? I’ve read the Finnish and English translations and enjoyed them, because it’s easier to actually see the book, and not only one’s own writing. Can you tell us about your novel’s path to publication? I’m a writer who likes to show pages to the editor early on, to get a feeling that something is under progress. So this book I showed the first 30 pages of only after about three months of writing. And then half of the book later on, etc. I think that the actual decision of publication was taken after about a year of writing. Then it took me about one year more to get it completed. What’s the most useful piece of writing advice you’ve ever received? I really think only two things are important: reading and writing. I don’t see how you can write if you don’t read. And secondly: you just have to sit down and write. Get the work done. This is often said but it’s true: don’t wait for inspiration, the inspiration comes – if it comes – as you are writing. I think that a writer shouldn’t edit too much in the early stages, just try to write, it might even be good to set a goal for each day. Don’t waste time moving commas around, you can do that later. Name one book you would’ve loved to have written. Thank you for sharing your thoughts about your writing. My review of this novel is now on the blog.